For the past 2 years I've received a free cookie from subway on my birthday. They send an email to you with the voucher, or you can just use your subcard and they scan it in to redeem. It's a QR code IIRC. It expires around a month after your birthday, but it's free! It's saved me from starvation once, hope it does the same for you! If you're out and everyone's getting subways and you have no money and are hungry it's quite nice! Still good, regardless. You never have to buy a subway, literally just get a card for free and get this for free. So VFM > your noodles. If you pickup the card in the shop do you have to write you d.o.b on it??? My birthday is in 2 weeks!! Aye, I think you just register it on their site, I couldn't find it either which was pretty weird so I was really surprised when I got it. But it's happened twice now, so I doubt it was just a random thing. I think the voucher they give you expires in 29 days including ur birthday as mine was on the 16ht of jan and voucher expires on 13/02/12. Oh, that's weird. Mine was 29th October and expired 29th of November. I think the voucher they give you expires in 29 days including ur … I think the voucher they give you expires in 29 days including ur birthday as mine was on the 16ht of jan and voucher expires on 13/02/12. Yeah, you're right, I just checked, and it says 26th of November, not 29th. Happy Birthday! We hope you've had lots of texts, calls, cards and hopefully a bunch of presents. We'd like to add one of our own to the pile. 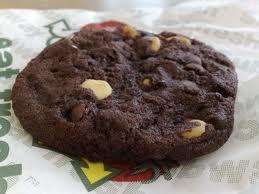 A delicious, mouthwatering SUBWAY® cookie - a small treat from us to make your day a bit more special. To get your birthday cookie, just head down to your local SUBWAY® Store. Simply print off this email or show it to staff on your phone for them to scan the barcode (just to the right). Your friends at SUBWAY® Stores." is the email I got. great deal my birthday is coming up soon! p.s. is it me? or is it that subway cookies (who specialise in subs lol) do the best soft cookies ever? better than millies and all that. p.p.s you should slightly warm it in microwave for 10-15 seconds absolutely beautiful! great deal my birthday is coming up soon! :Dp.s. is it me? or is it that … great deal my birthday is coming up soon! :Dp.s. is it me? or is it that subway cookies (who specialise in subs lol) do the best soft cookies ever? better than millies and all that.p.p.s you should slightly warm it in microwave for 10-15 seconds absolutely beautiful! Agreed =P. But I usually get them when they've been out for a while and they're stale ):. But when they are good, they're so very good. it was my birthday yesterday and I can confirmed they emailed me this to me on both my subway accounts!!!! Picture looks like a nutty dog ****. Nice!! That looks like something the cat did! Since you can update your Birthday online, free cookies for life? Thank you =P. I'm sorry for the picture! I can't change it now! You can try, I've never been cheeky enough to bother though. Just say you're like that guy who celebrates christmas everyday except it's your birthday ;P.
If you're out and everyone's getting subways and you have no money and … If you're out and everyone's getting subways and you have no money and are hungry it's quite nice! Still good, regardless. You never have to buy a subway, literally just get a card for free and get this for free. So VFM > your noodles.